Published by MINATO RESEARCH & PUBLISHING CO., LTD.
i, â # ¿ m^í £ M t if A L, t- ü ít h SM b*>iftíS CAi. 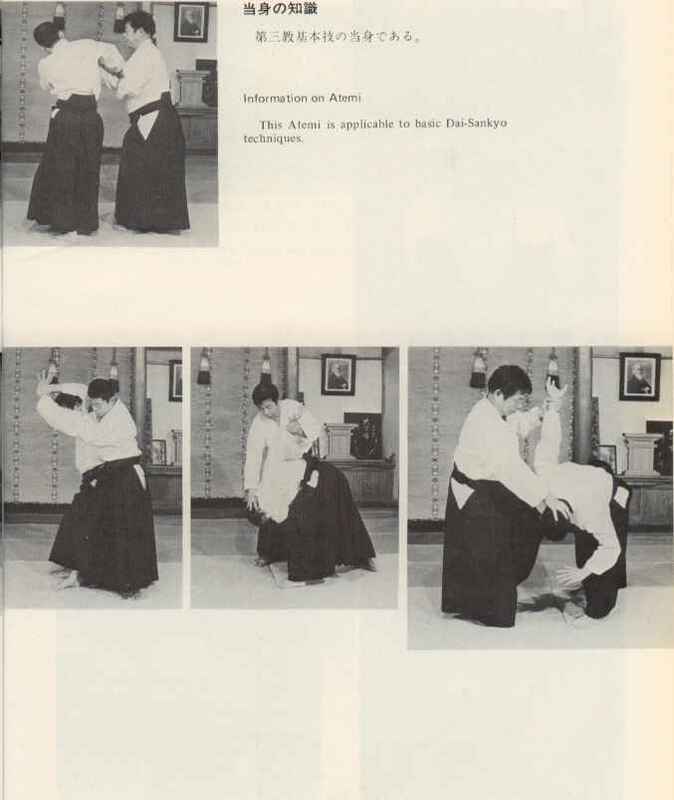 The current series of books on AIKIDO entitled "Coordinated Relationships Between Ken (sword), Jo (stave) and Taijutsu (empty-handed techniques)" was to have been concluded with Volume 3. However, when I reviewed the supposedly last book in the series, my mind began to be filled with memories of a number of essential techniques which ought to have been included in it. Hence the inevitable publication of Volume 4. Words of Old Master Morihei Uyeshiba, the late founder of AIKIDO, came ringing back in my ears while I was demonstrating the art for photographic purposes. A space of varied techniques, heretofore buried in my mind, then came flooding out. Had I forgotten the Founder, those words would never have come back. 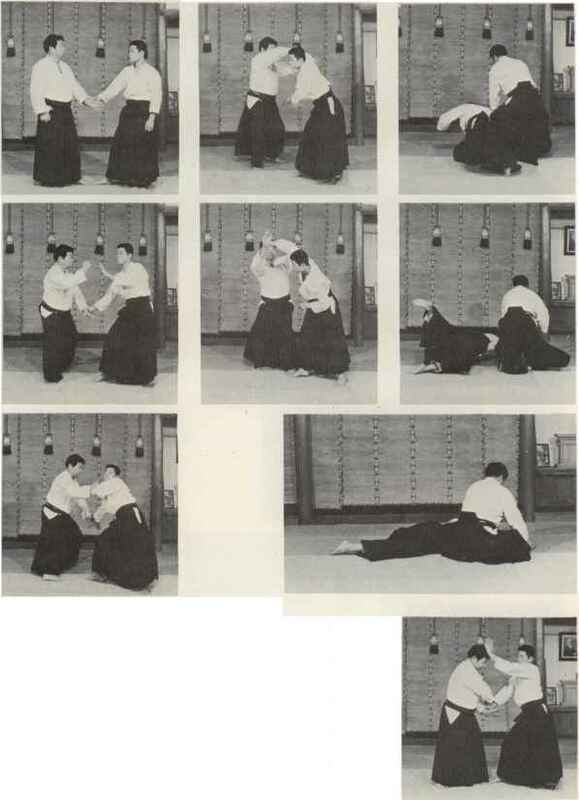 Highlights of this Volume are the introduction of rigorous exercises and Atemi or delivering blows to the body prior to applying techniques, as well as the explanation of the process of variations in Taijutsu. 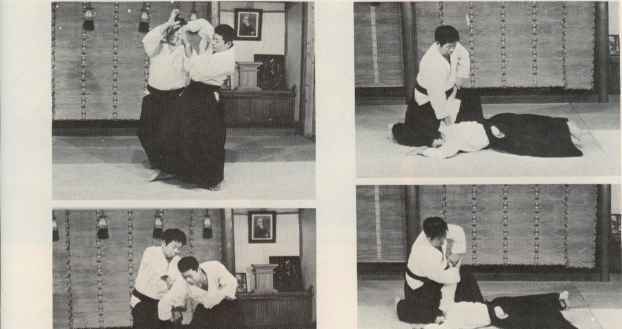 AIKIDO without varied techniques is bound to lose its real essence in the application of the Ken, Jo, and Taijutsu. The trainees must therefore acquire a total command of such varied techniques to the degree of rendering a match meaningless. 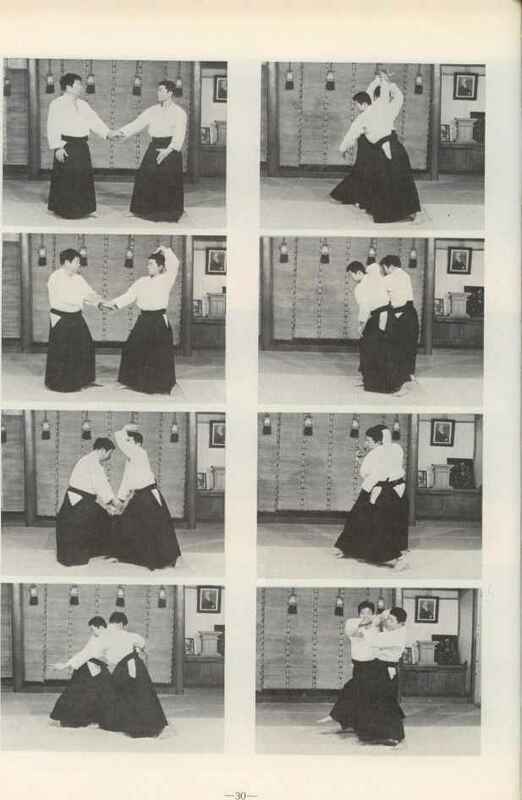 This book covers "Kaeshi-waza" or counteractive techniques which have been handed down exclusively to AIKIDO instructors. Due to the nature of these techniques, however, the coverage has been limited only to the basic types. It is to be desired that the instructors concerned will give their own thought to these techniques and make good use of them in imparting the art to their trainees. 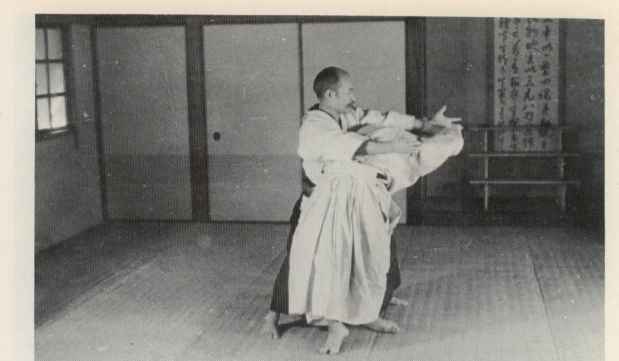 The AIKIDO techniques are arrayed in such a way that the unlimited ramifications of these techniques should be practiced systematically. If there is an opportunity in the future, I may wish to talk about teaching methods as well. 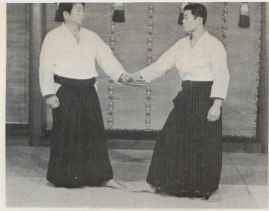 According to Old Master Morihei Uyeshiba, "AIKIDO is a divine truth which spells out a sophisticated implementation of TAKEMUSU A1KI." 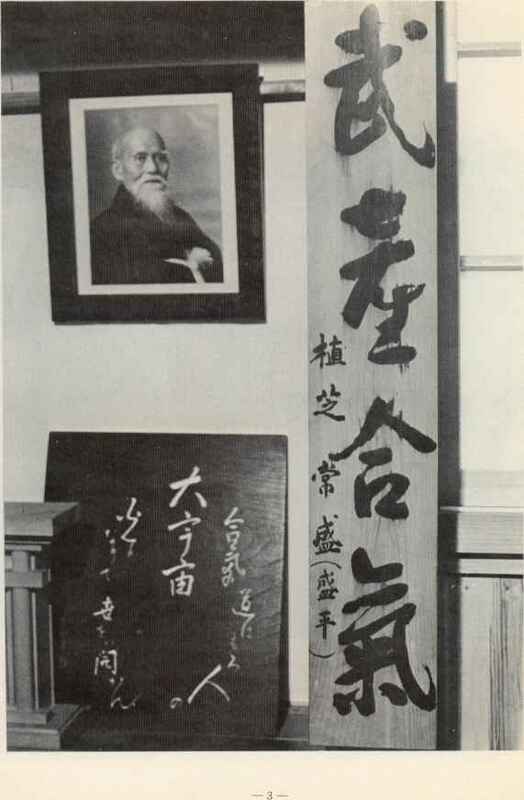 This means "AIKIDO is nothing without TAKEMUSU AIKI". 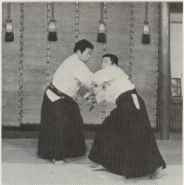 Consequently, "TAKEMUSU AIKI" should be a matter of paramount concern to the AIKIDO trainees. 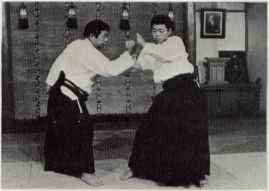 The ALKIDO Founder defined TAKEMUSU AIKI as follows: "TAKEMUSU, as identified in Shinto literature, is the unsurpassed martial art of Japan. The art therefore proliferates a multitude of techniques freely as Divine will sees fit." 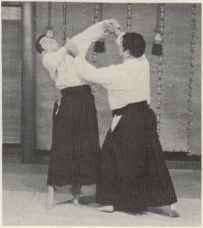 Such being the case, only by focusing our attention on the root of the kaleidoscopic techniques will we be able to get a few glimpses of the unfathomable depth of AIKIDO. 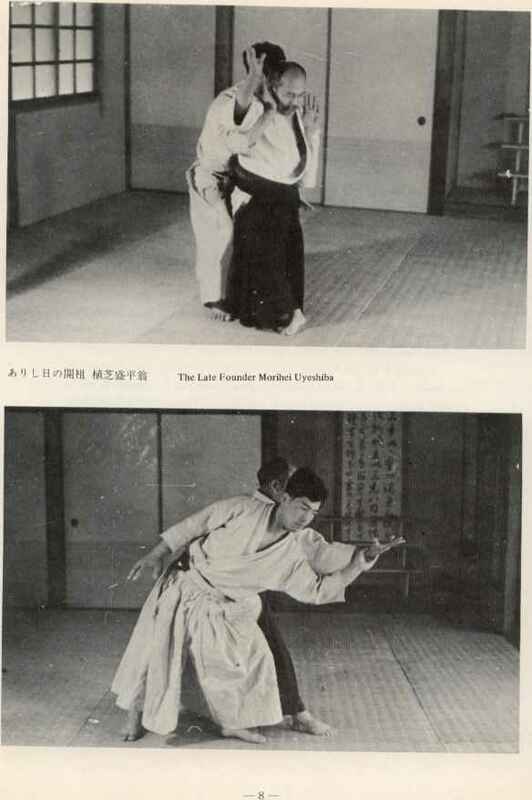 "The unlimited ramifications of the principle of swordsmanship", which received major attention in Volume 3, is explained in greater detail in this book. 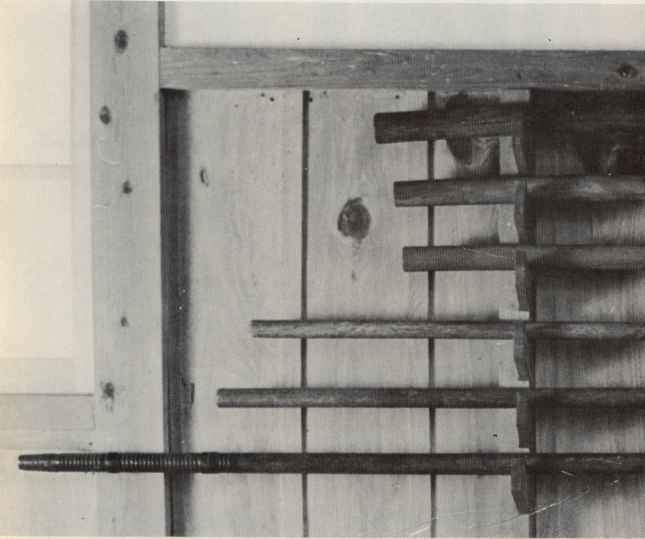 The process of technical variations becomes evident as the numerous techniques (varied techniques) created by the Founder are reproduced. 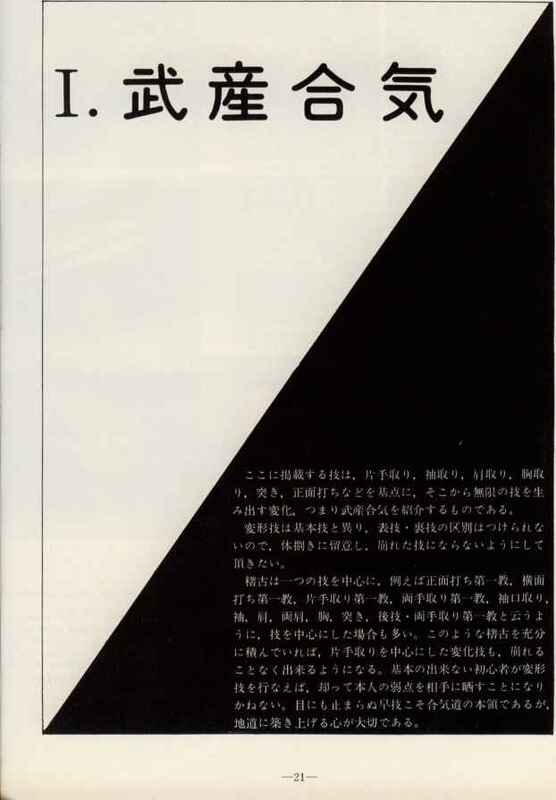 Main emphasis therefore is laid on varied techniques in discussing Taijutsu in this Volume. Care has also been taken in editorial layout to enable to readers to compare the varied techniques with their basic counterparts. To sum up, varied techniques are born of a blend with your partner. 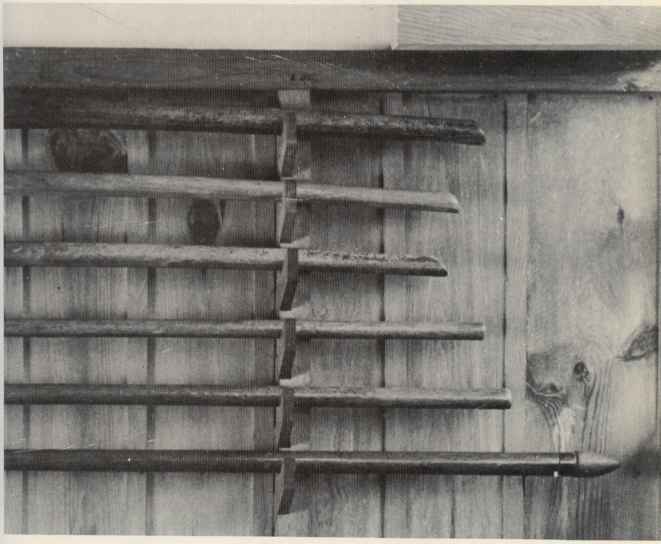 The Founder, however, strictly warned that "a technique will lose its effectiveness unless it is delivered with perfect precision." 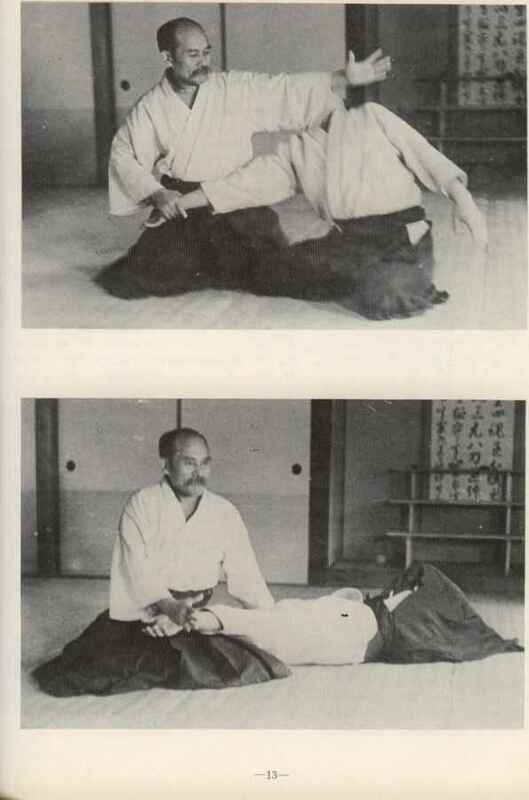 TAKEMUSU AIKI, in the real sence of the word, could only be mastered by observing the Founder's tenet in this regard, conforming with the ground rules and blending with your partner as a prerequisite to the execution of a host of varied techniques. There is no room for half-hearted techniques. 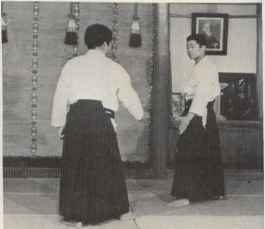 "Initiate your move first if you want to lead your partner," a lesson which, in AIKIDO terms, means stepping to the side of your partner in the initial stage of executing a certain technique. There is a deeper meaning than that, however. The lesson also points out the mental attitude which should be assumed in practicing TAKEMUSU AIKI. 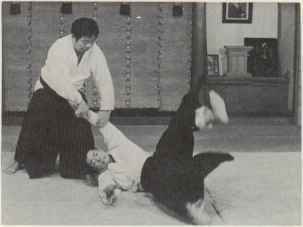 Abiding by this lesson is the only way to master perfect techniques in the realm of TAKEMUSU AIKI. 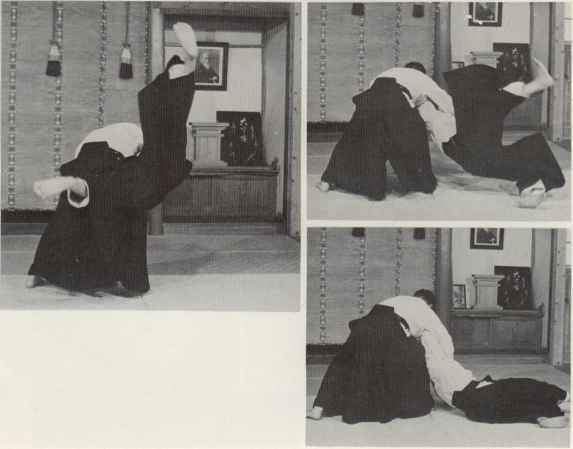 The principle of this lesson reflects itself progressively in a number of techniques in the form of a perfect Irimi or a perfect Shiho-nage. 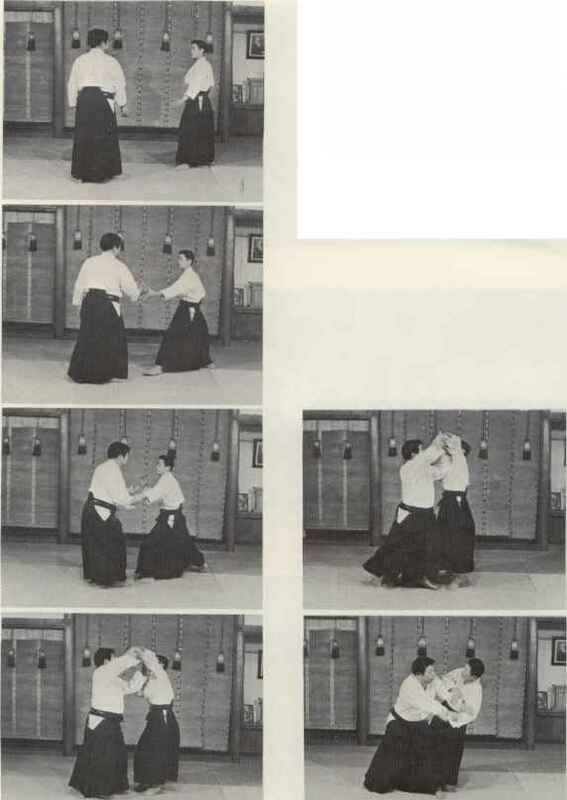 1 myself make it a rule to adopt this lesson in my AIKIDO practice. This is because if the lesson slips my mind, my techniques will become imperfect. Then there will be no possibility of my performing kaleidoscopic Taijutsu. Nor will it be possible to effect the unlimited deployment of the principle of swordsmanship. t! i ? 1) y<nt t iz ifm L, *ti £ t°<r>lj |ri] CIltKii", Hfl-^iO £ ti, otEt ® < è.
to ÌJ^^W^nnfi^l-i^LTÌIL, ti1 S ti tLlffttzUt L T jgi". «U^ ¿> tt1 ? n ri ti là tz Si£ L, \kfy b # ? il ti fi'fJU I-ilt. n, i [H]—-iri^^isto disharmonious mind and haphazard techniques which know no harmony. 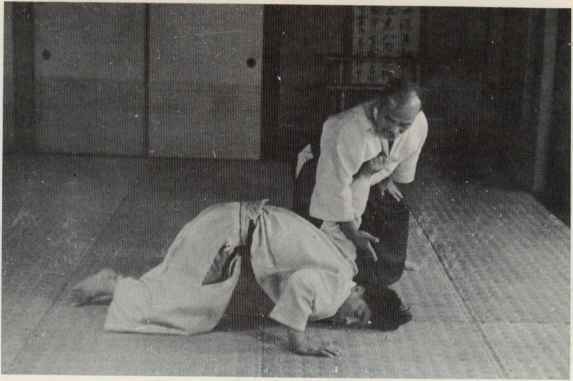 What is most striking about Kaeshi-waza is the subtle changes which could take place in Tai-jutsu. 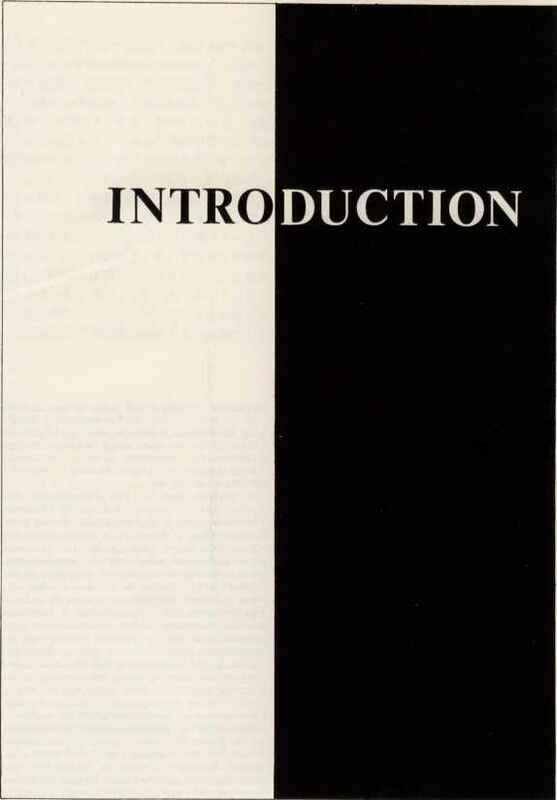 In studying the pertinent techniques shown in this book, your close attention is invited to such areas as how the force of your partner functions and in which direction that force is counteracted. Theoretical classification has no relevance to the variations. If, for instance, your partner tries to hold you down, lead the holding action downward and start counteracting. If you are held upward, let the upward motion continue up to a point where you can start your counteraction. If you are pushed from the right, divert the force leftward for counteraction. If the push comes from the left, the diversionary momentum is rightward. If pushed from the front, guide the momentum rearward. The push from the rear should be handled by giving it a forward momentum. In both cases, counteractions are indicated in the same direction as your partner's momentum. These simple movements, when combined in a complicated pattern, will plot out spiral curves, sometimes clockwise and at other times counterclockwise. Depending on the circumstances, the spiral curves are either centripetal or centrifugal. In other words, the variations could continue infinitely through a combination of three dimen sions - left and right, up and down and front and rear. 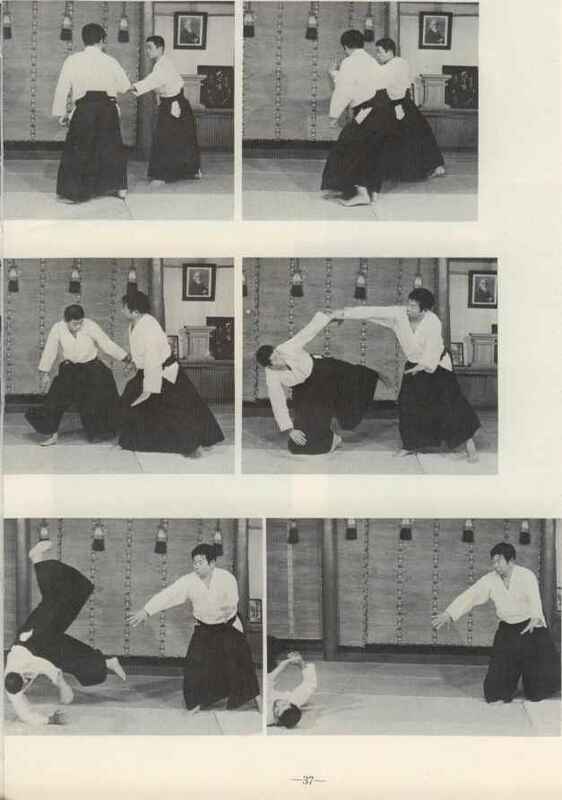 You might bear in mind the triangle A, circle O, and square which are the symbolic signs of AIKIDO, when you read this book with particular reference to stabilized body movements based on the so-called triangular pattern and the case of turning your body obliquely to pin down your partner in a circular movement. 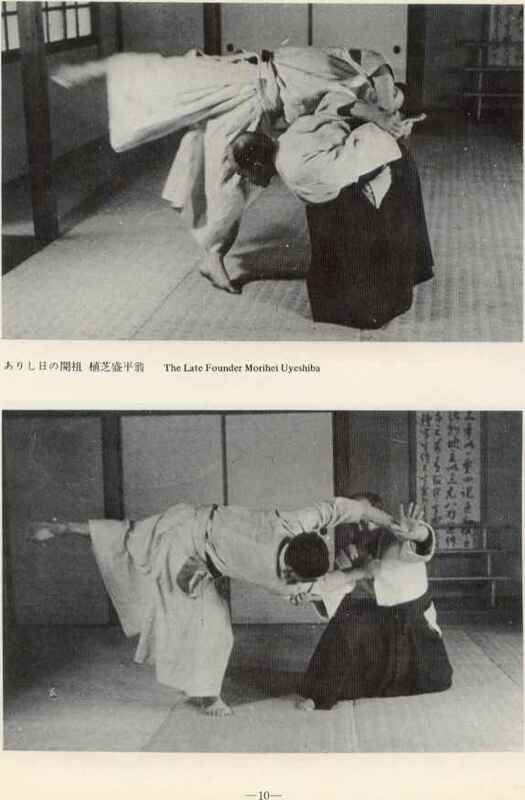 There are three traditional methods of AIKIDO training -SOLID, FLEXIBLE and Flowing (KI). These methods, however, could not be included in this book for space and other editorial reasons. If there is a demand for such information, I am prepared to put out a supplement covering that subject plus guidelines on how to cope with multiple attacks. 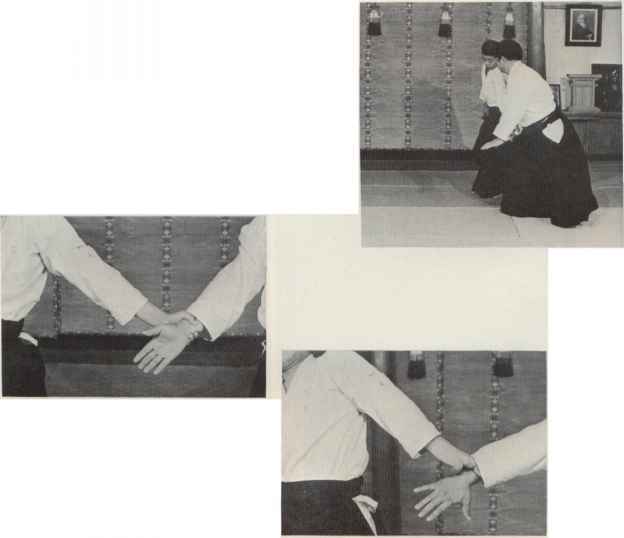 This section is designed to introduce TAKEMUSU AIKI which proliferates unlimited variations of techniques with Katate-dori, Sode-dori (cuff held), Kata-dori, Muna-dori, Tsuki, Shomen-uchi, and other basic techniques as primers. 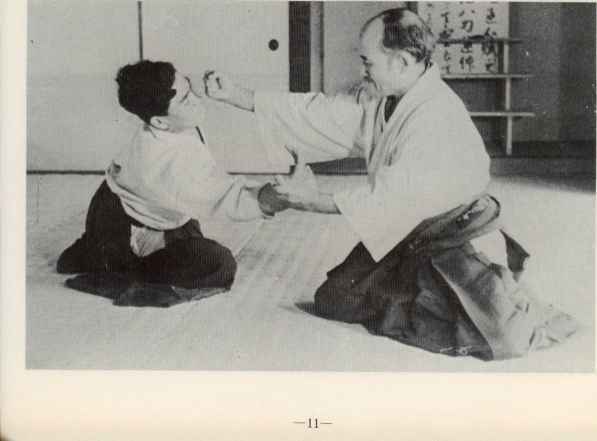 Unlike basic techniques, the distinction of Omote-waza and Ura-waza is hardly possible with these varied techniques. It is therefore important to pay close attention to the body movements so that the techniques you apply stay balanced. Trainees are advised to concentrate their practice on one particular exercise. An example is Dai-lkkyo in varied forms — Shomen-uchi, Yokomen-uchi, Katate-dori, Ryote-dori, Sode-guchi-dori, Sode-dori, Kata-dori, Ryo-kata-dori, Muna-dori, Tsuki, and Ushiro Ryote-dori. 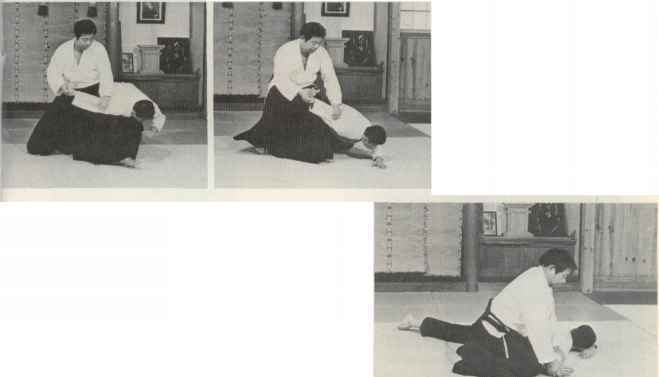 If a trainee successfully undergoes a sufficient amount of training of this kind, he should be able to perform variations, for instance, of Katate-dori techniques without losing balance. If the beginner, who is not familiar with basic techniques, ventures into varied techniques without preconditioning himself, he will only be exposing his weaknesses to his partner. 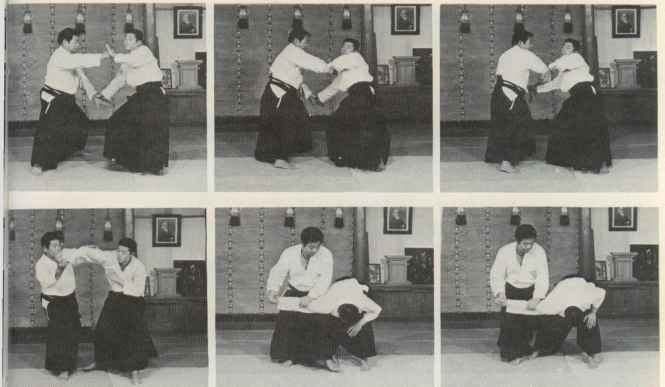 What makes AIKIDO what it is comes from a surprisingly rapid execution of techniques. 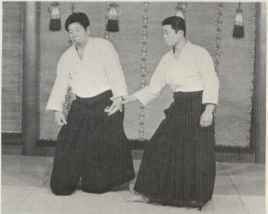 In order to attain this advanced stage, an attitude is required of devoting one's efforts steadily and unsparingly to the principle of TAKEMUSU AIKI. 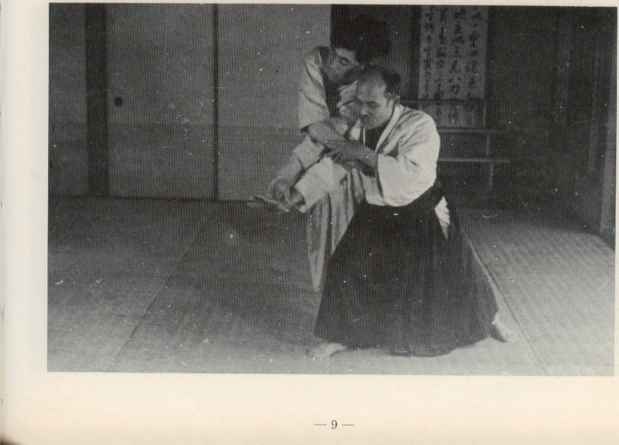 Takemusu martial techniques, which are created one after another infinitely, form a sphere when they are compounded. This sphere is supposed to symbolize a mind of harmony. 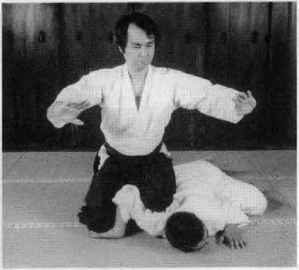 If you bear this in mind in your practice of AIKIDO, you will be able to carry out your varied techniques more smoothly. You will also find new and unexpected techniques welling up from sources beyond human perception. That pleasure I wish to share with all of you. 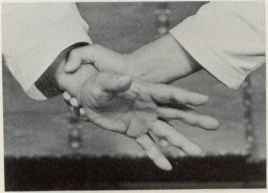 Omote-waza: When your wrist is held, be sure to fully splay your fingertips and charge them with your inner centralized snergy. When unbalancing your partner feigning a blow to his face, it is important to move your held hand to your partner's side and in alignment with your feet. It is wrong to draw your foot a step backward in front of your partner. 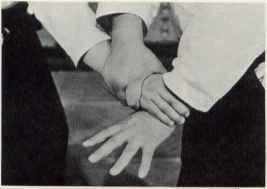 Ura-waza: In the basic exercise, it is mandatory to align your toes and pin your partner down circularly. 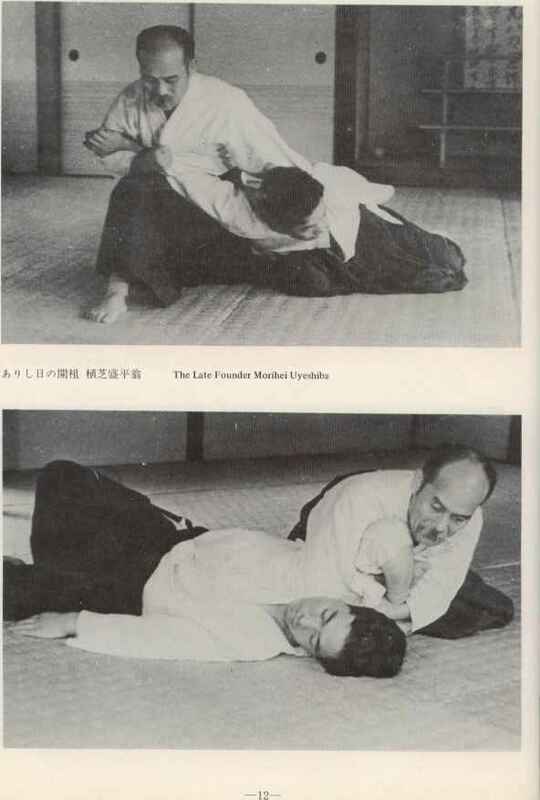 This technique is Ura-waza of Sode-dori Dai-Nikyo. 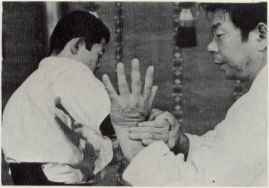 Atemi with the back of your hand can be used in common for a variety of Dai-Nikyo techniques. This is the applied form of Dai-Sankyo. Hold your partner's right hand down from above, initiate your upswinging motion and cut him down for a pinning hold. 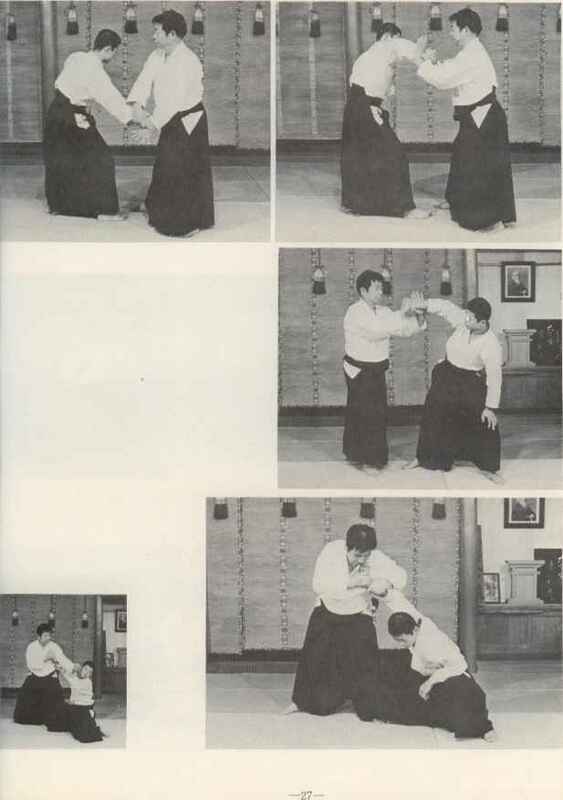 This Atemi must be applied without fail when executing the inward Kaiten-nage and Dai-Sankyo variations. When throwing your partner, deliver Atemi to his face with your knee. 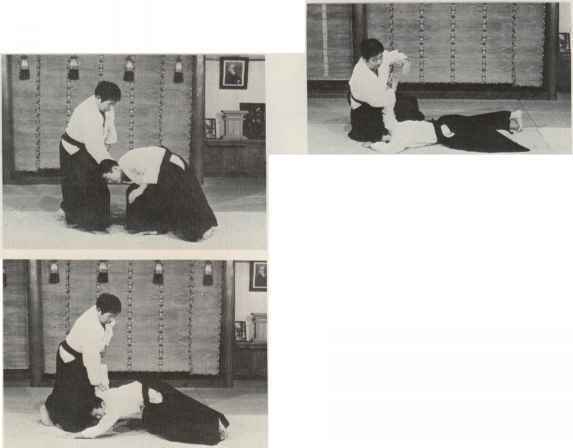 This is a variation of Kokyu-nage (abdominal breath throw). Note the opponent's arm is counteracted in the upper position. 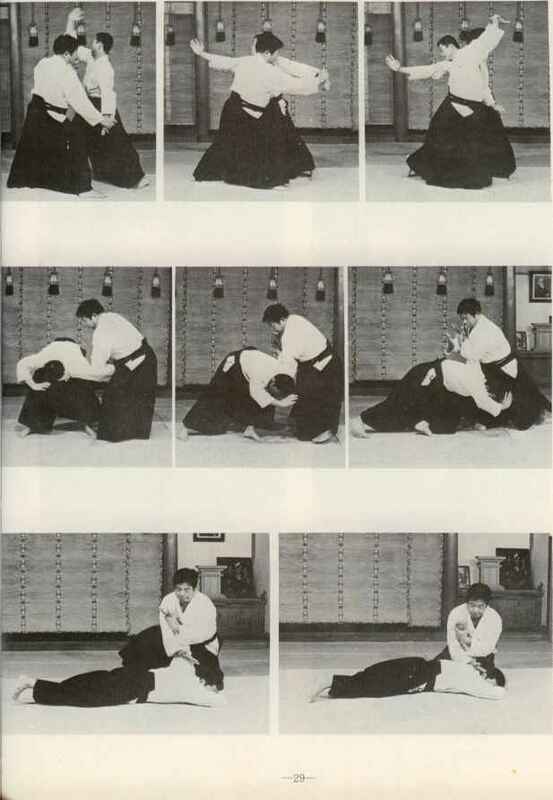 This Kokyu-nage is applied by swinging your Tegatana (knife-edge of the hand) up inside the arm of your partner. 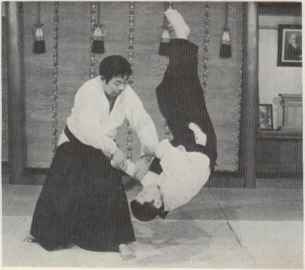 Deliver a blow to his face and unbalance him using his elbow from above. Atemi is the very essence of this technique. Don't forget about Atemi because if you do, you will be exposing the soft spot of your left side to your partner.